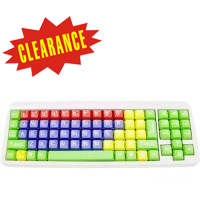 The Googolboard has large, easy-to-read and brightly colored keys with white legends to create a fun, creative, and educational environment. The familiar layout offers 3/4" keys with numbers, letters, and symbols, as well as Windows keys. The mechanical keyswitches respond to gentle finger pressure, providing tactile feedback while making typing easy and comfortable. The Googolboard is suitable for children, as well as adult users with visual impairments and anyone who finds it difficult to target the keys on standard keyboards. 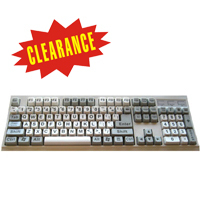 The keyboard is compatible with both PC and Mac (OS 10.3 or higher) and comes with a USB to PS/2 adapter. Note:This item is discontinued and is no longer covered by a manufacturer's warranty. However, the product is covered by our 30 Day Customer Satisfaction Guarantee. This keyboard features large print bold legends on regular size keycaps, making the lettering significantly easier to see. The Alps mechanical keyswitches are light-touch, tactile and durable. Both White (with Black keycap legends) and Black (with White keycap legends) are available. 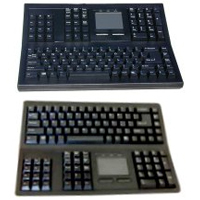 The RK-728 is a multimedia wireless keyboard with an integrated touchpad (not a Cirque Glidepoint) that can be used on your table or lap. 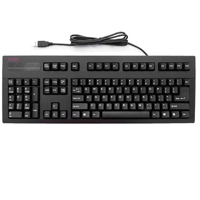 It has 86 keys (low profile membrane keyswitches) and 21 multimedia hot keys, including the MCE functions My TV, My Video, My Picture, My Music, and Live TV. 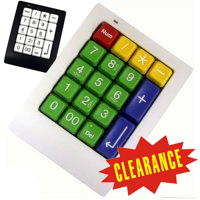 The touchpad inset includes 2 mouse buttons while the multimedia inset has a scroll wheel. 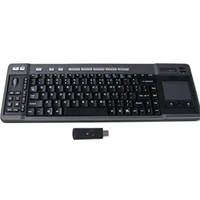 The keyboard's wireless signal has a 2.4 GHz radio frequency with 4 channels (USB receiver included and pictured below keyboard) and a working range of 10 meters. It requires 2 AA batteries and is compatible with Windows 2000, XP and Vista.